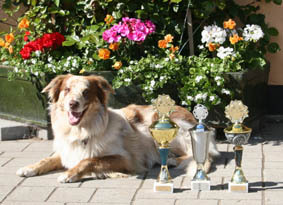 We breed Aussies you can use for reel work or every kind of dogsport. 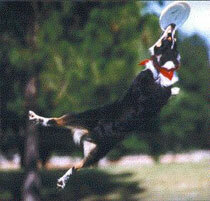 If it's Rally- Obedience- Agility- Frisbee- Seek- Heelwork- IPO- Herding- Trials! 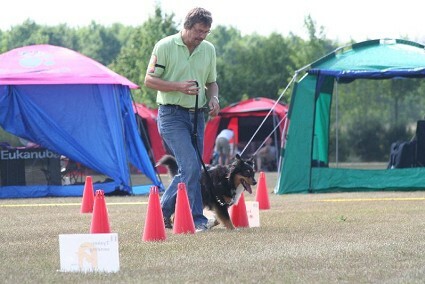 Several of our dogs are doing very well in competions in differents kind of DOG SPORTs! 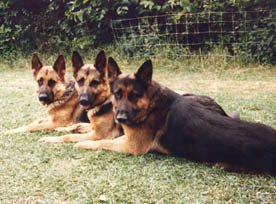 Our target group are puppibuyers who want to use their dog in sport or reel work on a farm, where it can be used what it's breed for. A indispensable helper in daily farmwork. LP1 Aussieligaen Uniqe STDs "Marble". 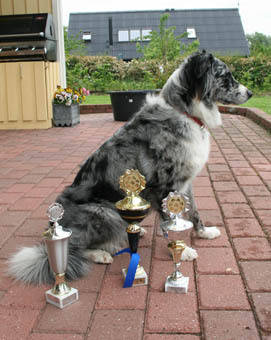 Wins a lot in obedience 3 times in a row and got her first leg sheep in working trials (May-June 07). Click photo to see more! LP1-2-3 DKLPCH RB RV Ligaens Never Ever Beaten Ninka has results who speaks for them selves The first aussie in DK to go to DM in LP1, 2 and 3! And selected for DM 4 years in a row! 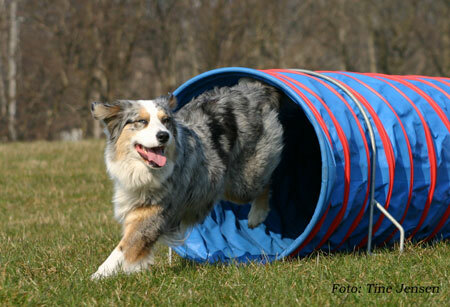 See more obout agility by clicking here. See more about Frisbee by clicking here. 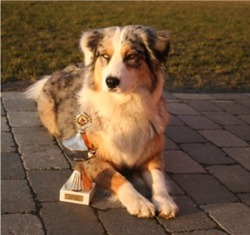 Aussieligaen Tipi WTCH have not only done an excellent working trial in all 3 kind of stock, but also winning a lot in obedience and agility. 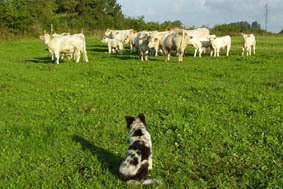 One of the yougest liga-dogs: Aussieligaen Xako on 12 weeks, are already helping on the "farm" to move the cattle from one place to another. Gather the cattle when they are runing out! Keep the sheep away until the feed is ready (they can ran over you when you are coming with the feed).He's unbelievable! Specially because he's only 12 w.o. and done it since he came there at 9 w.old. What can he do when he's adult? A Working Champ in working trials? 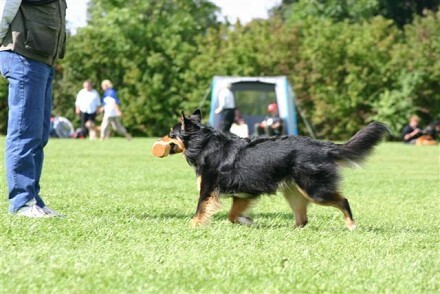 You can train a lot of different kind of dog sport with your aussie it you let it work independent. 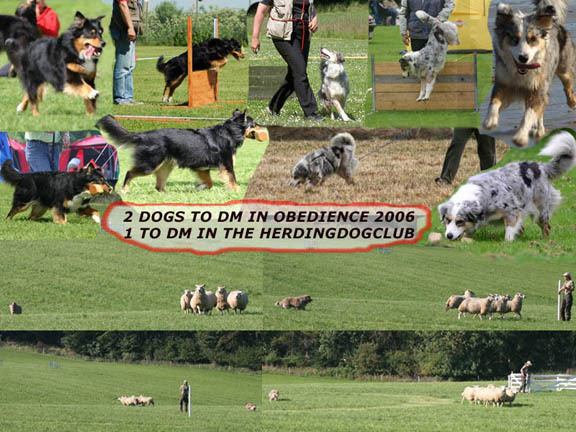 But if you have to much eyecontact like seen in obedience, you can get trouble in herding, where it have to have his eyes on the stock.